A hood cleaner’s number one job is to remove the fire hazard from your kitchen. 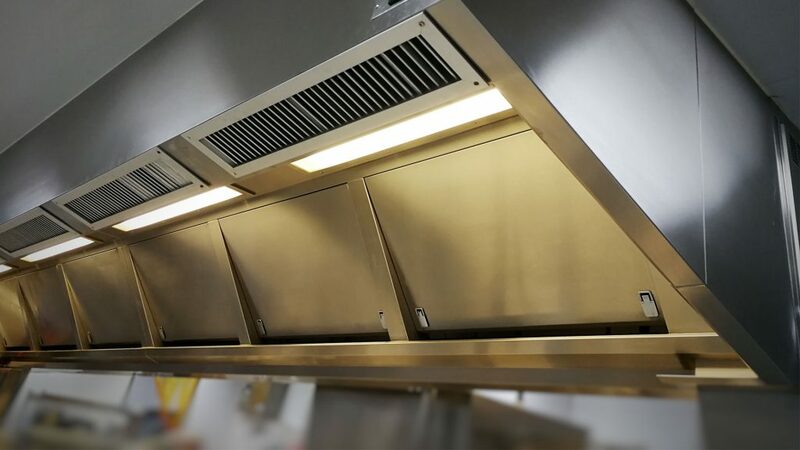 However, because the majority of hazardous grease build-up occurs behind the filters in a kitchen exhaust hood, it can be difficult to know whether a hood cleaner has done his job properly at first glance. This means it is easy for restaurant owners to fall victim to the classic trick: a hood cleaning that leaves your canopy, backsplash, and filters shining but your kitchen still at risk. The best way to ensure that your hood is cleaned properly is to plan on a late night so you are there with the crew. Catch up on paperwork, ordering, or your favorite show, but try to be in your office and make them aware that you will want to survey the job once it’s finished. In most cases, the exhaust fan will be on the roof of your restaurant, and the crew will not be able to properly clean without access to that area. If the hood cleaning crew does not inquire about accessibility to your roof, you know that the entire system is not being cleaned properly. Rather than being an afterthought, the serious work of degreasing and cleaning your hood exhaust system must include access to the exhaust fan, which is commonly located on the roof. Any professional hood cleaning company will take pictures of your kitchen exhaust hood before and after they do their work, including all of the areas that are hard or impossible to see when everything is reassembled. If they do not have photos or are not willing to provide them, they likely have something to hide, and your restaurant is likely still at risk. …and ask the crew to leave them off so you can see into the “behind the scenes” of the hood: the plenum and the duct shaft primarily. The section behind your hood filters is one of the most important when it comes to cleaning, and often overlooked because it is easy to hide behind shiny filters. If the crew is unable to hide that area, they will be much more likely to clean it properly. There is a switch on the side of your restaurant’s exhaust fan that the hood cleaning crew will turn off while they are working to ensure the fan is not started from below accidentally. If they are on the roof turning off the switch, it is a good thing, as it means your crew is likely cleaning everything! But, as soon as you come in after a cleaning, you’ll want to make sure you’re able to turn on your exhaust fan. If you are not able to turn it on, it means the switch on the fan was left off and you will want to call the company right away to have them return and flip the switch. Hood cleaning is a messy business, but so is cooking. If you come in the next morning to a mess, you’ll want proof that your staff didn’t leave it that way. Take pictures of the floor, appliances, and backsplash on your way out that night, just in case there’s a mess waiting for you in the morning. Hood cleaning is an essential service for maintaining a safe and code-compliant restaurant, but it only works if it is done right. We hope these tips will help your ensure you are receiving the best cleaning possible!